Have you ever heard of a mini split or ductless air-conditioner? They are known as a mini split because it is a miniature version of a traditional home AC system with both an indoor and an outdoor unit. That is where the similarities end. It is also known as ductless since most applications do not need ductwork, however there are some mini split systems that can have ductwork attached. Each application is unique and a professional air conditioning contractor needs to assess each situation individually. The applications are practically limitless! Do you have a Florida room that you can’t get ductwork to? Do you want to turn your garage into livable/workable space? How about not just supplementing your home AC system but if you like to sleep in a really cold bedroom, why cool the whole house down and waste energy when a high efficiency ductless system can cool down the one room? Do you have a server room that you need to maintain a constant temperature to protect your valuable data? A ductless system could be your answer! With a multi-zone system one outdoor unit can be connected to up to 8 indoor units, each independently controlled. If Susy wants her room to be 78 she simply adjust her room temperature. If mom and dad want to have their room at 72 they simply adjust their own remote control thermostat. The flexibility is limitless! 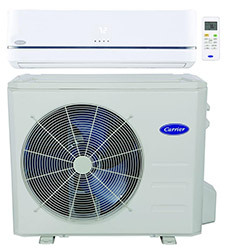 Ductless mini splits utilize inverter technology to maximize energy efficiency and avoid temperature and humidity swings. Like a dimmer switch for lights, these systems automatically speed up and slow down to adjust to changing temperature and humidity conditions. Motion Sensors on the units can detect movement in a room so the units automatically power up and down to save energy. Find out more about your specific application and how we can best help you by contacting the Tampa air conditioning experts from Simpson Air. Give us a call or contact us online today! “The technician from Simpson Air was very professional, knowledgeable and thorough. He explained all that he was doing, showed findings of the A/C inspection and maintenance needs. We felt very comfortable and confident with his work. Great service!” - Edward G.